To further the post ‘Free Speech on the Internet‘, I put together this hypothetical Microsoft Customer Service Help Guide as it might appear in the Chinese version of Windows XP (people’s-republic-in-your Home Edition). I wrote this after I had read that on top of the fact that Yahoo! 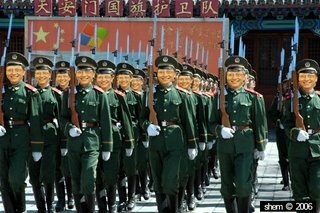 is helping send people to prison for speaking thier mind, Microsoft Corporation had been contracted by the government of China to manage China’s Web Portal, thus ensuring that generations of Chinese people to come will learn to love the ‘General Protection Fault’ as much as we do. Microsoft has teamed up with the Chinese Government to help better manage your web experience. Write articles on your very own blog! Use chat rooms! Message your friends! We will help ensure that you receive the most benefit from being online. We have also introduced a series of security tools that will help prevent you from saying, doing, and ultimately thinking anything that might hurt your friends, family, your mistress or dog. Using electrodes. Microsoft cares about your privacy. For information about how Microsoft helps protect the privacy and security of your data, please click the help button. Q: The Chinese authorities are after me for writing a rebellious and yet bland entry on my safe and private blog. What should I do? A: Call your local Microsoft Service Center and leave your name, number, date of birth, Citizen I.D. number, where you were last night, where you think you’ll be in your house in the next eight minutes time, and your approximate tolerance to pain. Your call may be recorded for quality and training purposes. Q: What do you think of China’s blatant human rights violations? A: Although we appreciate that sitting on hold with technical support for three hours can match and occasionally exceed the pain of experiencing China’s colorful torture and information extraction programs, we feel China should be absolved of all blame. Q: I think I wrote the words ‘Taiwan should be a Republic’ on my blog. How can Microsoft help me? A: We can’t. Unless you can come up with 23 billion dollars in contract fees, we know where our loyalties lie. And we think you do too. Q: How many Chinese people does it take to change a light bulb? A: One light bulb means nothing. Only many light bulbs can be strong and illuminate the farthest reaches of capitalist darkness. At least that what they keep telling me. Q: My 3ghz Pentium processor and my 128mb AMD graphics card seems to have a type 3 conflict with Windows which keeps returning a ‘system driver violation’. I tried to reboot using a back up registry but to no avail. What should I do? A: You seem to have illegally downloaded Intelligence 1.2 . Please revert to using Serfdom 1.0. That should clear up the problem. Q: My revolution seems to have crashed and all my ideals and fanaticism has been lost. What should I do? A: Press Ctrl-Alt-Del and reboot your revolution. This time, install more police and anti-dissent protocols. That should clear up the problem. If that doesn’t work, invade a small neighboring country to increase your support. Hey, it worked for the lousy stupid Americans. to your nearest detention facility for processing. while i don’t agree with the level of control the chinese government has over the people, i see that: given the history of china and how power changed with whomever had the stronger army/revolutionary force, strict control is the resulting change to protect the “stability” of that power. in their eyes if controling the people to avoid revolution/change to maintain their hold of the country’s reigns then so be it.